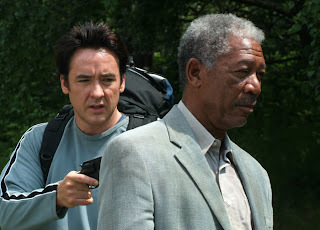 The latest film from respected director Bruce Beresford, starring John Cusack and Morgan Freeman and shot by acclaimed cinematographer Dante Spinotti seems to be a peculiar candidate for a direct to DVD release. However, The Contract never played in American theatres and it’s a shame since, while some of the work is a bit predictable and does recall The River Wild, it’s a taut, entertaining little suspenseful action film brought to the video shelves by First Look International Pictures and one that I found gripping only twenty minutes in-- enough so that I forgave some of the simplistic and trite dialogue and had to finish the whole movie in one sitting. Cusack plays former police officer and now current gym teacher and baseball coach Ray Keene who, still reeling from the loss of his wife to breast cancer two years earlier, is struggling to bond with his rebellious teenage son Chris (Jamie Anderson). After Chris is arrested for marijuana usage, Ray decides the best plan is the most proactive and physical one—the tried and true male bonding ritual called camping and despite both of their better judgments, they set off into the Washington wilderness, completely oblivious to the fact that down the road a horrific car crash has taken place when mercenary assassin-for-hire Frank Carden (Morgan Freeman) is attempted to be released from federal custody by his criminal team, only for the plan to go terribly wrong. When the car crashes down into the river, good samaritans Keenes rush to the rescue and are given a gun by a close-to-death U.S. Marshal and instructed to walk the handcuffed Frank to a nearby road and dial 911. Of course, there is no cell phone service in the dead of the wild and while they try to find the road, they realize that they are being hunted by the rest of Frank’s crew and thus after an admittedly cheesy opening begins a highly entertaining action movie. Soon the men encounter a duo of campers and the film cuts over to other simultaneous action such as the well-meaning local authorities whose power is usurped by Washington intelligence as the President is due to make a public speaking engagement in the area and they fear foul play, along with going back to see Frank’s crew try to track down Frank as well as the Keenes. Much better than some of the Hollywood garbage being released during the summer season at the local Cineplex and much cheaper than the price of an adult evening ticket, The Contract makes for a great night-in without the uncomfortable seats, thanks to the astute direction from Australian filmmaker Beresford (Driving Miss Daisy, Double Jeopardy), great cast and heightened intensity thanks to the photography by Spinotti (L.A. Confidential, Heat).